with Grovenor Terrace & St Michaels intact. The school grounds look smaller than I remember. I thought they were enormous when I went there. The winding drive and imposing buildings. I loved my time there. The Pillar at May's shop clearly visible, what was that building at the front of the Church ? I just can't remember if it was there when I was kid. keeper wrote: what was that building at the front of the Church ? Still there Keeper. It's the first shop on the block on The main Street. Ebs I think? Now I am confused I thought that space had been cleared and is now open space where the "lads" sit on the wall after being up at the "clinic" I can see the gable ends of the shops opposite Patrick Street, which is what I remember, but that building I don't, maybe it's my senior moment but I never remember going into the Church between two buildings and that building looks like it's practically on Marine Road. Keeper, I think Gulliver mentions those buildings being demolished somewhere on this site. Thanks Sinead, Jemser, any idea when they were demolished, it's wrecking me brain,I made my communion and confo there, so I was seven for my communion around 1954, I remember it well but not the buildings ! of posts on this site that land was owned by the Church. Thanks Sinead ! No wonder I never remembered them, ah, I can sleep easy now ! Keeper here is a quoted post from Gulliver that explains what the buildings were and when they were demolished, it is in the Canon Murphy discussion dated 2nd December 2012. "McDonalds Ironmongers (Thomas & Mortimer) was on the corner of Marine Rd/Georges St until after 1935, and the wall of McDonalds facing Marine Rd was a plain wall. I have old pics, which appear to show the railings of the church extending along the side of McDonalds. That seems to match with this pic. Having said that, the railings appear to run very far down Marine Rd at the other end??? Sorry folks I thought it was this building at the front. I never knew they were demolished. St. Michael's Church in Dun Laoghaire. Back in the day there were 2 shops in front of the church. 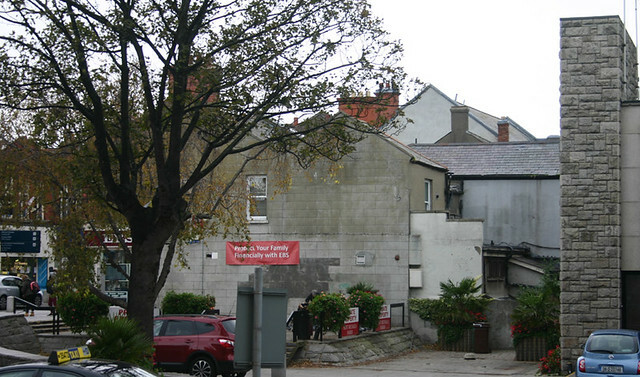 On the corner of Marine Road/Georges St was Moynihans wholesale grocer. That was demolished about 1901 at the same time as the demolition of the frontages across the street (all of the frontages between Patrick St and Mulgrave St were demolished and rebuilt 14ft back). 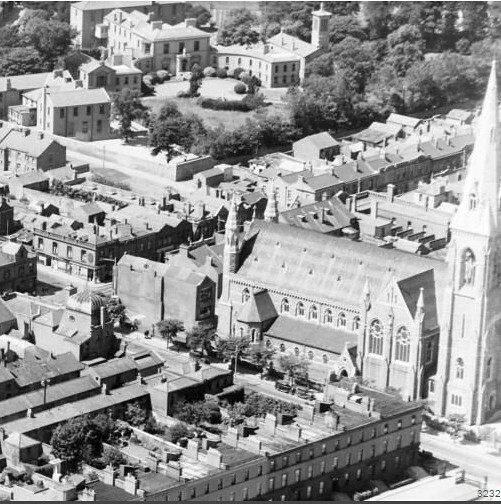 The combined result was the enlarging or opening up of a very tight town centre - but the church somehow appears to have got possession of the cleared Moynihan site and railed it off as their own. Then McDonalds was demolished after 1935. You will notice that a part of that area (beside the EBS) has rails on one and a half sides. That area is the old entrance to the church, and is still owned by the church. I don't know who owns the rest of the open area. Today I saw the funeral of one of the late nuns (RIP) from the Dominican Convent make its way to St Michaels church with about a dozen or so Nuns walking behind the hearse I was just wondering do the nuns get buried in the Convent cemetery or is there one in Dun laoghaire. There used to be Holla when I was there nearly 50 years ago. My beloved Sr Cecilia died while I was at school and we went to the funeral.It is so long since I have been around the back of the school don't know what is there now. Just looked at RIP.ie and she was buried in the convent alright.